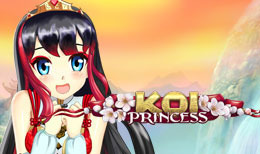 Join the Koi Princess on an anime adventure through the land of online slots and earn your fortune when you spin through 5 reels of oriental serenity. Spin the reels as the beautiful Koi Princess admires your work and match wave wilds and bonus cards to earn yourself a wealth of golden coins and free spin bonuses. Over the past 2 decades NetEnt has rapidly become one of the leading providers of premium gaming within the online casino circuit. As pioneers of the industry NetEnt have created a large portfolio filled with enticingly thrilling games played by millions of gamers daily from Sweden to Ukraine to the United States of America. Trusted by a global marketplace, NetEnt are known for delivering a relaxing yet stimulating experience throughout their over 200 boundary defining games. Koi Princess by NetEnt brings the rich vibrancy of Japan right to our screens in the form of a 5 reel, 20 pay lines online slot. With no less than 4 randomly activated features within the base game this game can be both exciting and fast paced. Before beginning with Koi Princess, the player has the choice to activate the ‘Bonus Bet’ mode or not. If activated the cost per spin is doubled but the chance of activating one of the 4 random features is also drastically increased, improving the players chance to win the jackpot total. Wild symbols represented as a Japanese wave motif throughout this game will substitute any other none bonus symbols in order to help the player achieve the highest paying pay line possible during the main game. These may be replaced by Special Wild symbols such as Expanding Wilds and Random Wilds during the numerous bonus features Koi Princess holds. The 5-Hit Feature – This guarantees a randomly chosen winning bet consisting of 5 matching symbols during the 1x free re-spin. The winning symbol is selected by a spin from the “Wheel of Fortune” which holds all none bonus symbols. The Random Wild Feature – This Koi carp will generate between 4x and 9x Wild cards to overlay the existing board in a random fashion and then stay in those positions for the following 1x free re-spin. The Wild Reels Feature – Between 2 and 5 randomly chosen reels will be completely covered by Wild symbols during the subsequent re-spin. The Bonus Activation Feature – If the Koi selected holds this feature the plater will see 3x Bonus Game symbols appear automatically on reels 1, 3 and 5 during the following game round. After which one of the 4 bonus features will be activated. Sure Win Free Spins – 10x initial Free Spins with the first x5 containing a randomly placed overlay Wild symbol. The ‘Sure Win’ for the first Free Spin game is set on 20 coins multiplied by the selected betting level of the machine or 40 coins if the player is in Bonus Bet mode. Wild Reels Free Spins – This feature awards the player x10 Free Spins with every spin having between 1 and 5 reels completely covered with overlay wilds. Before each spin the Wilds will readjust to new randomly determined positions. Coin Win – Coin Win awards the player with an instant coin win or the current bet randomly multiplied by a number between x15 and x30. Bonus Wheel – If the Bonus Wheel is triggered a 3 tiered ‘Wheel of Fortune” will appear. On its rings the player will see x1, x2, x3 and x5 multiplier symbols, arrows, collect symbols, double up symbols, Sure Win Free Spins and Wild Reels Free Spins symbols as well as a Coin Win Jackpot Symbol placed in the centre of the wheel. A dice is then thrown to determine the number of positons the wheel will spin after which the symbol will trigger one of the following actions. Taking an anime aesthetic to the main protagonist and pairing her with seamless animation sequences from her surroundings makes this game inviting and fun to play. A large range of bonus rounds that contain player choices give an extra dimensions to the game, feeling in charge of your own fortune elevates this game from other similarly praised online slots. The additional mix of modern Japanese references set against the traditional symbolism excites the eyes while the game excites the mind.